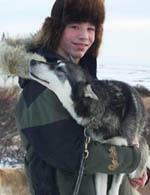 Michael Miller, 16, moved to Alaska with his siblings and parents in 1998 from southern California. He says he started mushing in 2005 when a friend gave him an old leader. He then got “hooked.” He is home schooled through IDEA in the 11th grade and enjoys snowboarding, trapping hunting and other outside activites. He and his family live six miles out of Nome where he has his own kennel of 24 dogs. He plans to go to college and get a degree in aviation or veterinary science and he says he will continue mushing.